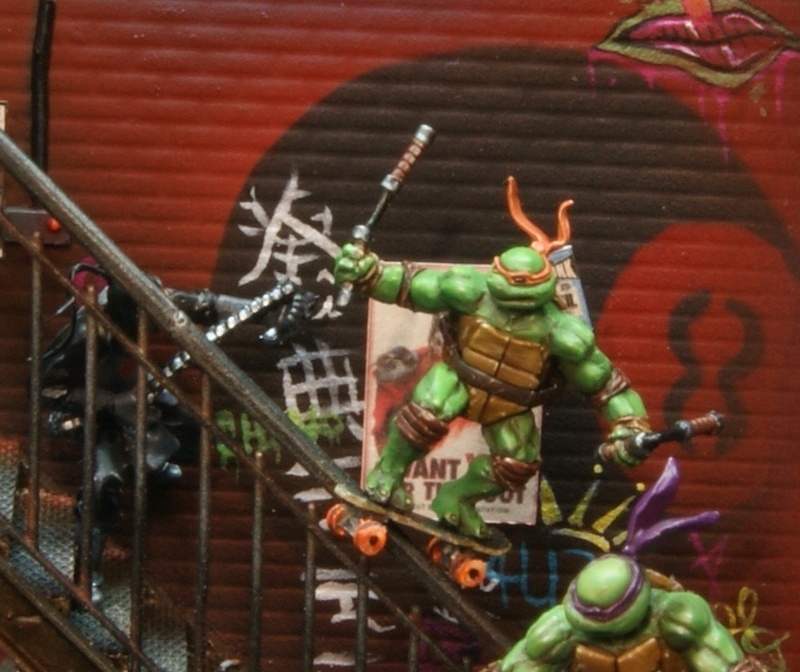 “Turtle POWER!” The Teenage Mutant Ninja Turtles fight the Foot. 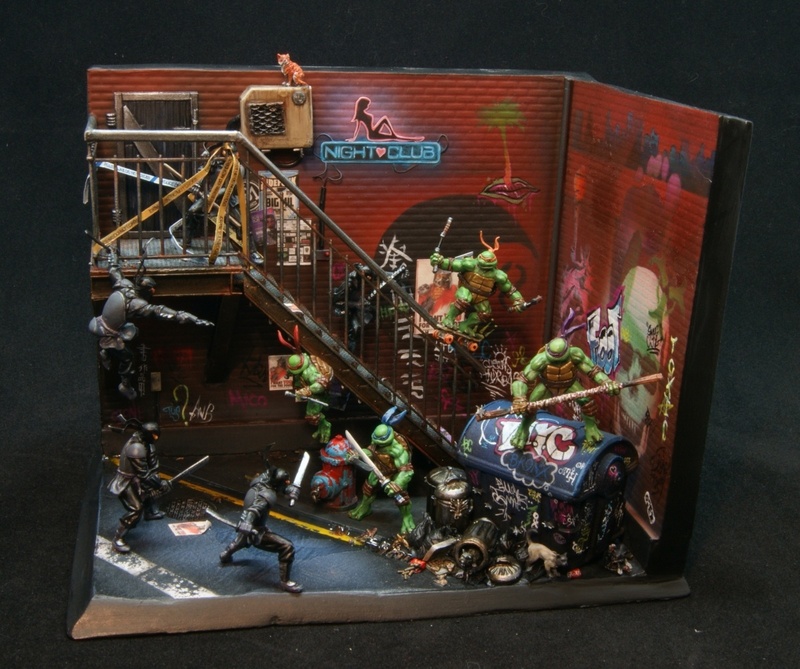 It started as soon as I set eyes on Fancagne Didier's incredible Turtle sculpts. 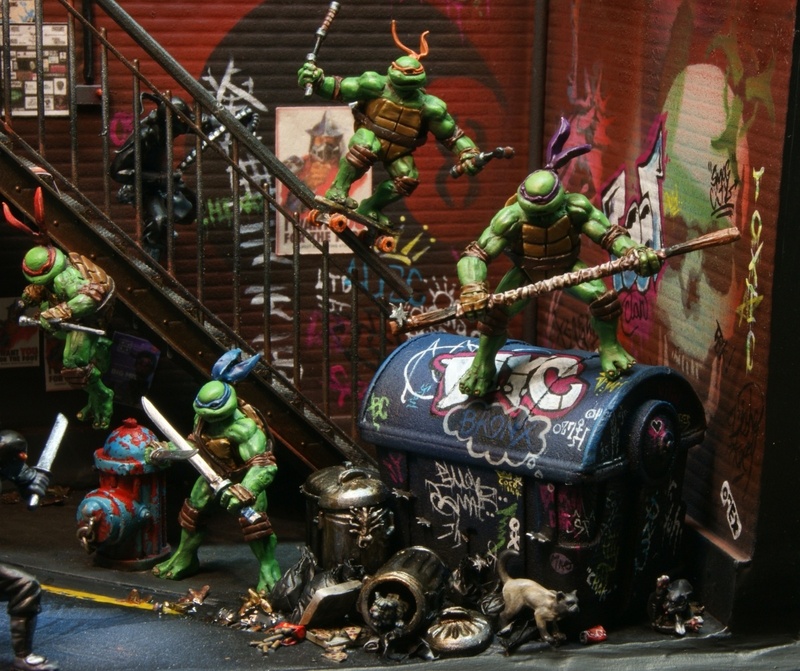 I had the image of a street battle deep in the Foot Clan territory. I enjoyed working on this project for the last three weeks. I have made a lot of things myself from scratch like the bin bags and the rubbish, the little pizza and french fries, the AC unit the fish bones and banana skin. I got to practice Neon lighting and got some advice from my friend Ian Fakenbridge on how to paint Neon, Fancagne helped so much, especially giving me the kind of feedback most people would run away from! (Cutting off Donny's head after he was painted and glued on the bin was priceless, but looks much better than he did...) I was inspired by my cartoon heroes from childhood and happy days. Who didn't want to be Leonardo or Raf when they were a kid??? I used Broken Toad brushes, and an airbrush for some bits, acrylic paints from Citadel, Vallejo and Scale 75. Follow the link for step by step WIP photos. There are a lot in that folder. This is for the 'Eavier metal Facebook groups 1st birthday painting contest, it is entered in the Master's Sci-Fi category. It is the most enjoyable project I have worked on to date. I really hope you like it!! AAAAAAAAHHHHHHHHHH! This is so awesome!!!!!!!! Many thanks Zab!!! I’m glad you like it!!! Many thanks for all your support and encouragement my friend!! There are very dynamic and action in this dio ! Excellent work , really like the whole scene, congrats !!! Gold ! True Masterpiece ! Many thanks Simon!! The tutorials you made were great for those coke cans and cigarettes!! Cheers!!! Thanks Roman!! Glad you like it! so many details - awesome diorama!